I have a few favorite blog posts here at StarbucksMelody but they’re so quickly forgotten! Once in a while it seems to me to that I put a ton of work into a blog post, and then a month later, nobody even remembers that it once existed. I have been blogging consistently for nine months. This blog started new September 2009, and somehow, I’m still blogging. Along the way, I’ve created a few blog posts that are absolute gems, but now buried in a sea of blog entries. (Well, whether they’re gems is subjective, but in my humble opinion …). Perhaps this is a sign that I update the blog too frequently. ^That is an amazing blog post. I had sponsored an art contest, and when you click on that blog entry, and scroll around, you’ll find a visually delightful post showcasing Starbucks-barista created chalkboard art. Even if you have seen that before, I recommend you go back and look at it again. ^ That blog is an incredible coffee education about how Sumatra is sourced. If you’re like me, you’ll be in awe of how much care and work goes into a semi-wash bean processing method. It’s a great read for those who want to really understand what’s inside a bag of Starbucks Sumatra coffee. ^ I routinely meet partners who give me a blank stare when I tell them they should visit a Starbucks cupping. I tend to think that newer Starbucks partners only initially understand the important of a coffee tasting to one’s coffee education and do not consider that a cupping is also part of coffee education. Both are important. One can learn a tremendous amount by tasting coffees and even learning what foods to pair with the coffee. In contrast, with a cupping, the purpose is develop the palate and discover the absolute unique characteristics of a number of coffees side by side without being influenced by food. A cupping is also the coffee industry standard at the level of the coffee roaster to determine the best roast profile for a bean. When you look on a bag of coffee and you see a description like, “lively and nutty”, these words come from a coffee master’s experience with cupping the coffee and not a coffee tasting. ^ I love that blog post too. There really are some distinct and independent variables that affect this sum total thing we call the “Starbucks Experience”. I’ve identified three components of the Starbucks experience and explained why they’re independent variables, and all three pieces must be satisfied for a great Starbucks experience. I recommend this blog post highly to anyone in customer service who genuinely wants to understand the relationship between customer and retail employee. ^ That blog post is exactly as it says it is: The very first annual report produced by Starbucks Corporation for its shareholders. The document itself was produced on extremely heavy cardstock and included beautiful art inside of it. Notice that in 1992, Starbucks operated 154 stores. This is simply an amazing historical document to look at where we’ve come from. I will be posting the 1993 Shareholders’ Report in the not too far future. ^ That blog entry can be read and discussed on many levels. Part of it is just the fun of catching up with Winter and seeing where he is at on his adventure to visit every company-operated Starbucks in the world. The other part of the blog post deals with how should a CEO respond to seeing customers, whom he recognizes, in the place of business open to the public. For me, that day represented some disappointment because it is the only time that I’ve run into him and he hasn’t looked me in the eye and smiled, “Hi Melody.” Odd day. Hopefully it doesn’t mean that Starbucks wants to fire me as a customer! LOL. And there was great disappointment that Howard did not get to shake Winter’s hand. That part of the experience troubles me. ^ I like this blog post particularly because of the visuals. It’s a lot of fun to sit there and scan through the old Clover coffee menus and see what was offered before. Some of the rare Kenyas have never cycled back into the stores. The Kenya Thunguri really did have a strong black tea note to it. I remember that well. By the time I fell in love with it, it was gone it seemed. Ahh. The pain of coffee is that it is an agricultural product and it comes and goes. I remember really liking the Bali Batur Highlands too. ^ I like this blog post because it really shows the direction that the Starbucks store design team is moving. The featured stores here are not heralded as “flagship” stores but represent new construction and an older store that went through a remodel. This store design, as featured in this blog post, is the future of store design. I’ve often joked that 2009 was the year that store design rocked. Starbucks opened up First and Pike Street store (“Heritage”), 15th Avenue Coffee and Tea, and Roy Street all in 2009. And I believe that Paris Disney was opened in 2009 also. But these showcase stores are not the exception: They’re becoming the rule. That is precisely what this blog post is about. ^ What’s fun about this blog post is that it is a preview of Iced Via Ready Brew in the future. What will your local Starbucks have available this summer? Click on this link to find out. This is the “scoop” on Via. One way to browse old posts on this site is to click through the “archive” tab or the “categories” tab. I recommend it. For now I’m just going to highlight the posts listed above but there have been a number of other posts that I’ve found useful and interesting. I hate to talk about my own content in that way, but at times I have managed to post some interesting things. I hope I’m not alone in thinking this. Feel free to discuss any Starbucks-related topic in this thread. Frappuccinos. Happy Hour. Starbucks and FourSquare. Via Ready Brew. Favorite syrups. Discuss anything about Starbucks. Also, if you think this blog is updated too frequently, or not frequently enough, I’d be curious to hear your thoughts. I think I average about 3 updates a week. Commentary: Starbucks Then and Now. An all-new Teavana experience: Southcenter Teavana. I posted about your blog which I stumbled upon last night. I will definitely go back and read your past posts. Thanks for sharing your love of Starbucks! Hi Denise! Sales of the Frappuccino have really been sluggish at my favorite Starbucks, but that is what is normal for that store. My favorite store only does – literally – about 40 or 50 Frappuccinos a day. That is all day. It has just one blender, and has a customer base that drinks a lot of brewed coffee. Has two brewers!! (most stores have just one brewer though may have more urns) and one blender. That sums up the customer base well. Our Happy Hour sales haven’t been as expected either. However, the weather is supposed to be nice finally on Saturday and Sunday of this week so I expect that we’ll be a lot busier. (At least, I hope) It’s kind of a love/hate thing actually. I want us to be busy, but I also fear the busy, because no matter what anyone says, it takes longer to make these new Frappuccinos than it did the old ones. Melody: I’m pretty sure my regular store has 3 brewers….. ? will see in just a bit. 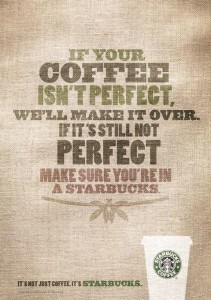 @Donna and @GAStarbucksgirl – Thanks for the great words. @GaStarbucksGirl – Congrats on your store having such a fabulous happy hour. Wow 200 Frappuccinos is a lot!! Your blenders must’ve been earning OT. @Donna – You have know idea how the little props like what you said mean so much to me. Its your comments, and people like you who are participating, that really help keep me motivated. Thank you. Otherwise, it would be me having a monologue and that would be really dull. Having a Mocha Frap w/ dark cherry – yum! Went to the Phinney Ridge store (in Seattle), where they were more than eager about selling Fraps! No line at the time, and the barista was cradling 3 cups – practically before I ordered! – asking which size I wanted. Good flavor, and the whipped cream does not seem as heavy – which is good (it’s been ages since I’ve had one). The first one I ever had, the whipped cream seemed almost plastic-like, if you know what I mean. Now it seems lighter & sweeter. And Melody, I do hope you do another ‘barista art’ posting again! Definitely my favorite! Favorite post: Barista art! I loved that one. Starbucks topics: Starbucks needs to improve the noncoffee drinks! I want better hot chocolate. And they could add Thai iced tea. Mmm, Thai iced tea…. Post frequency: Three posts a week is a good frequency, I think. Your posts are good substantial ones with plenty to read, so you could get away with two a week if you’re getting tired or you feel that they’re being under-read. But there definitely aren’t too many. My favorite post has gotta be the Sumatra one. I read it over again today! both stores i have gotten the new fraps at so far have been so busy during happy hour i skipped happy hour! as I was saying: (but found out the facts) My regular store has two brewers, two blenders, and averages about 80 frapps a day. And I am interested in your next article about Iced Via Ready Brew released soon. Donna – Just ask the barista to add more ice. I’m thinking if you upsize the ice scoop it’ll be more like the old ones. It’s not the standard, but that doesn’t matter. For favorite posts…I love the coffee reviews and reviews of the products. It helps me to want to branch out and try new things rather than my old stand-bys. Barista art was beautiful too of course! What a wonderful set of blog articles! I praise you for what you are doing here, as it is very creative and imaginative and I can see the hard work you have put into this site for your passion for Starbucks. I wish you well in whatever you do. You definetly have a unique one of a kind site here, and I’d love to help you to get the word out about it. Hi Bruce! Welcome! I love hearing that kind of thing. This blog definitely has a goal of spreading coffee enthusiasm. Thank you for commenting – you made my day already!